Emerging Asia-Pacific cannabis markets could present massive opportunities for international cannabis companies targeting expansion. Researchers and physicians are increasingly looking to cannabis for combatting the opioid epidemic. It’s no secret that the cannabis industry is booming at an unstoppable rate with new companies and developments seemingly appear every day, thanks to the legalization steps both in the US and Canada. Still–despite plenty opportunities for investment, stepping into the sector is treated as a high-risk operation by some an analysts. That mindset, however, has begun shifting as the industry shows no signs of slowing down. For example, according to a report from New Frontier Data, in 2016 the legal cannabis sector was worth roughly $7.2 billion–up from $2.7 billion in 2014. Looking ahead, the market is expected to grow at an annual rate of 17 percent. In particular, medicinal marijuana sales projected to reach $13.3 billion by 2020, up from $4.7 billion in 2016. On the recreational side, sales are projected to jump from $2.6 billion in 2016 to $11.2 billion by 2020. Giadha Aguirre De Carcer, founder and CEO of New Frontier Data said that projected total market sales may exceed $24 billion by 2025, with close to 300,000 jobs by 2020. Of course, cannabis is still illegal at a federal level, however it’s now legal in eight states while 28 have it legal in some form at a medical level. In terms of stocks, there’s certainly a plethora to choose from. In the US, American cannabis stocks include Terra Tech (OTCMKTS:TRTC), a company that is looking to perform some research on plant science. The has now company signed a lease for a 13,000-square-foot cultivation complex in California. 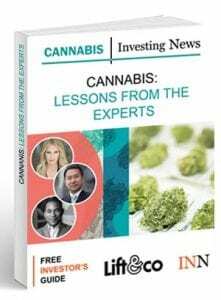 Cannabics Pharmaceuticals (OTCMKTS:CNBX) presents an interesting alternative for the use of cannabis, seeking to develop cancer treatments based on natural cannabinoid products. With the industry as vast as it is, the American Cannabis Company (OTCMKTS:AMMJ) provides consulting for companies embedded in the regulated cannabis market. The company has helped its clients win over 13 cannabis licenses in eight US states. North of the US border, Canada is preparing itself for full legalization of cannabis, while many companies are already active in the industry. In December 2016, the Canadian government released a report on cannabis legalization and regulation, which included 80 recommendations for framing legalization effectively. In that regard, legalization–at a recreational and medicinal level–is expected to happen July 1, 2018. In surging legalization forward, in April 2017 the TSX launched the first ever cannabis ETF, Horizons Medical Marijuana Life Sciences (TSX:HMMJ), which includes a list of 14 companies to start off with. Steve Hawkins, president and co-CEO of Horizons ETFs Canada said in an interview with CBC that interested investors of the exchange are the type of people who believe there’s a growth story with the marijuana industry. Still, he cautioned that investors may feel uncertain about volatility surrounding Canadian cannabis stocks. “If you’re invested in one company, you’re taking a lot more individual risk from an investor perspective,” he said in the interview. Some of the companies in the ETF include Canopy Growth (TSX:WEED) Aurora Cannabis (TSXV:ACB), Emblem (TSXV:EMC), and CanniMed Therapeutics (TSX:CMED). Fully licensed and compliant growers and dispensaries in well-regulated cannabis markets to spread their infrastructure costs over a period of time. The program is designed to help near-term infrastructure needs paired with long-term exclusive supply relationships. Indeed, the cannabis sector has come a long way in the last few years. With legalization ready to take shape in Canada and the US pushing for the same, the industry has made it clear that it’s here to say.